(ZESTER DAILY) It’s that time of year when raising a glass of bubbly is de rigeur. What would commercials be without happy people clinking flute glasses of delicately hued golden nectar, tiny bubbles making a purposeful beeline to the rim of the glass? But what about revelers who don’t like Champagne or sparkling wine? While I can hardly believe such folks exist, the fact is they do, and they eschew these carbonated wines for a variety of reasons. For some, Champagnes and sparkling wines are too dry. For others, they are headache inducing, and for yet others, they are too high in alcohol. What, then, to do when asked to raise a glass of cheer to ring in the new year? Raise a flute of dry, hard apple cider instead. In the 18th century, hard cider was the preferred drink of the American everyman. Most often brewed at home, it was drunk at breakfast or in place of water — by men, women and children alike. Hard cider went out of fashion in America as beer took over as the everyday alcoholic drink of choice. Up until recently, the little hard cider still made in this country tended to be overly sweet — more reminiscent of soda pop than the ciders of yore. Clark said that was due to a process called back sweetening, adding sugar after the drink has fermented to give it a much sweeter taste. Happily, however, a new crop of craft cider makers, following the footsteps of draft beer distillers, are producing drier and more sophisticated ciders that are neither sweet nor syrupy in finish or appearance. 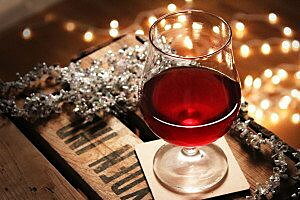 Cider is a renaissance cocktail and the alcohol content ranges between 6 percent and 8.5 percent. When testing hard ciders to use in place of Champagne or sparkling wine, consider the level of acidity, particularly when pairing them with rich holiday foods or for drinking alone. Here is a primer on available hard ciders as an alternative to Champagne for ringing in the new year. Devoto Orchards in Sonoma, Calif.: The orchard’s Cidre Noire, 1976 and Golden State Cider truly live up to the spirit of the craft. Dry without a hint of the vinegary aftertaste found in some dry ciders, the surprise star in this line is the Golden State Cider in a can. Effervescent and almost mineral-like, once poured it lives up to any bottled version and is my favorite for toasting. Cidre Noir is best served with fatty foods like cheese or charcuterie, while the 1976 works well with spicy fair. Eve’s Cidery in Finger Lakes, N.Y.: I’ve long been a fan of Eve’s Cidery Northern Spy, which I first sampled at the New York City restaurant Northern Spy Food Co. It is extremely tart with hints of apple cider vinegar, so it’s not for everyone and is best had with food. The cidery’s Albee Hill Still and Dry is a delicate wine-like cider worth trying for a more subtle cider experience. Snowdrift Cider in Wenatchee Valley, Wash.: Like winemakers in the region, Snowdrift produces a good and dependable product with little variation and democratically appealing flavor. The Cliffbreaks Blend is tannic enough to stand up to both fatty foods and stand in for sparkling wines for toasting. Eden Sparkling Cider in Newport, Vt.: This half-sized bottle is one of the most Champagne-like of the hard ciders I sampled. Made with English apples and aged in French oak for a deep golden hue, this product works nicely as a substitute for cocktails that require Champagne as a base. Farnum Hill Ciders in Lebanon, N.H.: This is a drier line of ciders, and it includes a still version.The green-labeled Extra Dry was most to my liking, but the Red Labeled Semi-Dry is also hardly sweet — and Champagne aficionados will find that, despite the lower alcohol content, even the semi-dry is less sweet than champagnes of the same description. Sonoma Cider in Healdsburg, Calif.: A fun brand of hard cider that harkens more to commercial varieties like those by Vermont Cider Company, but with a far drier finish. The Hatchet is an apple variety, while the Pitchfork represents pear, and the Anvil has added Bourbon flavor, making these ciders feel like a good, stiff drink. These are good options for beer or harder-liquor drinkers who would like to raise a bubbly glass with body.